This design was awarded the first prize in the School of the Art Institute of Chicago's Student Government (SAIC) logo design contest, and is now part of the organization's permanent identity. SAICSG's logo design was inspired by the work of minimalist sculptor Sol LeWitt, whose simple, repeating geometric forms evoke a sense of openness and incompleteness. In the logo, the open shape of the cube is a metaphor for the Student Government's overall philosophy and mission: to provide a strong structure of resources for students while maintaining complete transparency. The simple, graphic quality of the logo design inspired the creation of additional shapes for usage in a seamless pattern that can be expanded infinitely in any direction. SAICSG's logo and seamless pattern provide a range of possibilities for print collateral. Simple, stark typography introduces a static seriousness that is counterbalanced by the dynamic playfulness of the pattern. Business cards allow one shape from the pattern to be "borrowed" by each member of the Student Government during their term. 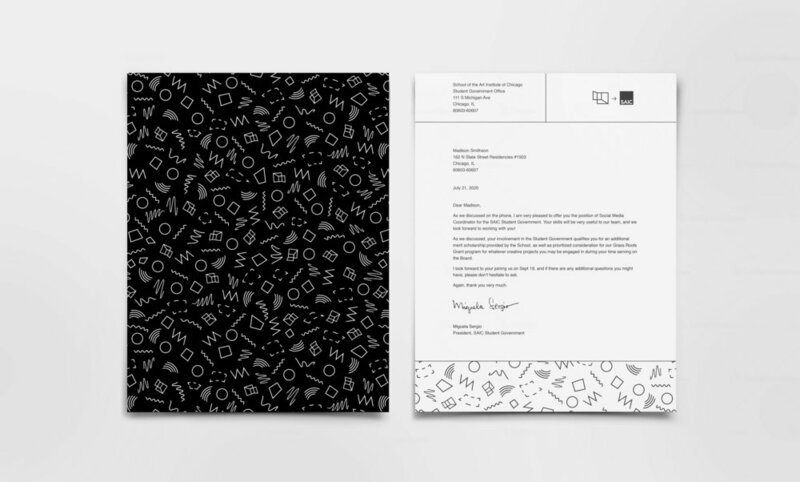 SAICSG's letterhead design features a white reversal of the pattern in the footer area, showing the design's versatility on different background colors.